In a saucepan, stir 2/3 cup white corn meal into 1 cup cold water. Bring to boil over medium high heat, stirring constantly until boiling. Cover and reduce heat to very low and simmer for 10 minutes. 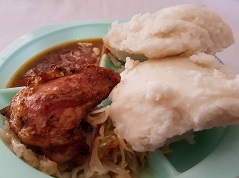 To make a smooth Nshima, beat the mixture by pulling the wooden spoon towards the side of the pot and pressing the lumps out between the pot and the spoon. To serve, use a large metal spoon to form lumps (about ½ cup each). To keep the Nshima from sticking to the spoon, keep it wet with cold water.